Have you tasted it yet? Insane. Chile en nogada at Chávez. My review in this month’s Seattle Met is Chávez, the 12th Avenue bar that in its short life has become one of Capitol Hill’s indispensable stops. Here’s why. But my review couldn’t allot enough space for a full rhapsody on the chile en nogada, Chávez’s tribute to his history. And his mom. It’s a tricky dish, involving 12 ingredients and a skilled hand with the roaster. “If you overcook the chile at all, it will fall apart and become hard to stuff.” Chávez skins the pepper, a poblano, and cleans out its seeds to make room for the filling—a dense blend of ground pork, ground beef, white wine, pine nuts, capers, walnuts, apples, pears, raisins, and candied cactus. 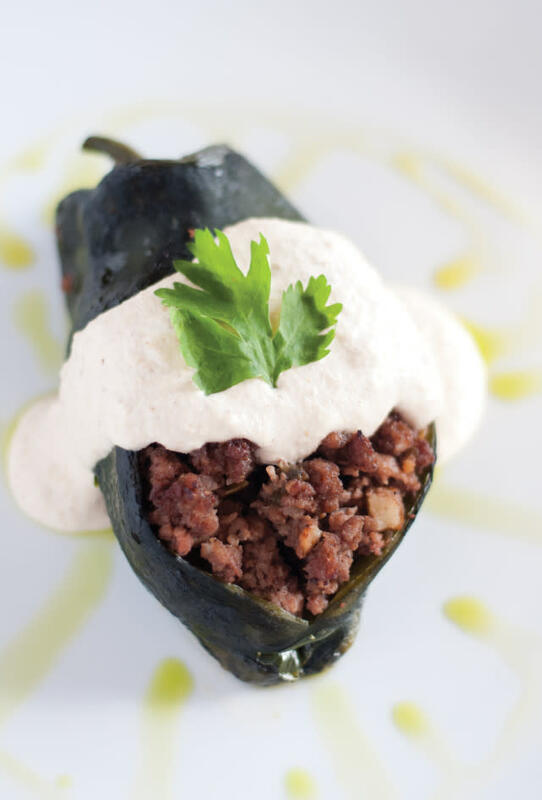 The stuffed chile arrives topped with a walnut-sherry sauce rich as a bold Spanish Romesco. It adds up to a dish that recalls the sweet-meaty combinations of medieval or Moorish cuisines, delivering a complexity that will be—I promise—the most satisfying food experience you’ll have in a bar, anywhere. Turns out this dish is traditionally eaten on Mexican Independence Day. Which, as it happens, is Wednesday.